University of Toronto professor and famed media theorist Marshall McLuhan’s legacy continues to reach far and wide, shaping the way people think about culture and technology. It’s his scope of influence that has earned McLuhan’s library and archives, housed at U of T and at Library and Archives Canada, a spot on the UNESCO Memory of the World register – a collection of documents and materials from all over the world that seeks to tell and preserve the story of humanity. UNESCO is a United Nations group that advocates for co-operation between nations around education, science, culture and communications. “It's a rich addition to our global documentary heritage and we’re delighted to have been chosen as stewards of this unique material,” said Larry Alford, U of T’s chief librarian, at the announcement event, which took place Tuesday at Robarts Library. This is the fifth Canadian entry into the Memory of the World and U of T’s second – the first is original archive materials, including research documents, related to the discovery of insulin at the university, which led to a Nobel Prize for Medicine. Library and Archives Canada, a federal-run institution, holds the personal archives of McLuhan, including letters and photographs, and U of T Libraries has his massive library – 6,000 published items, which are mainly books, and the notes and newspaper clippings he stuffed between their pages. “Both UTL and LAC are committed to celebrating the legacy and memory of a great thinker who arguably belonged to the world as much as he did to Canada,” said Guy Berthiaume, the Librarian and Archivist of Canada. 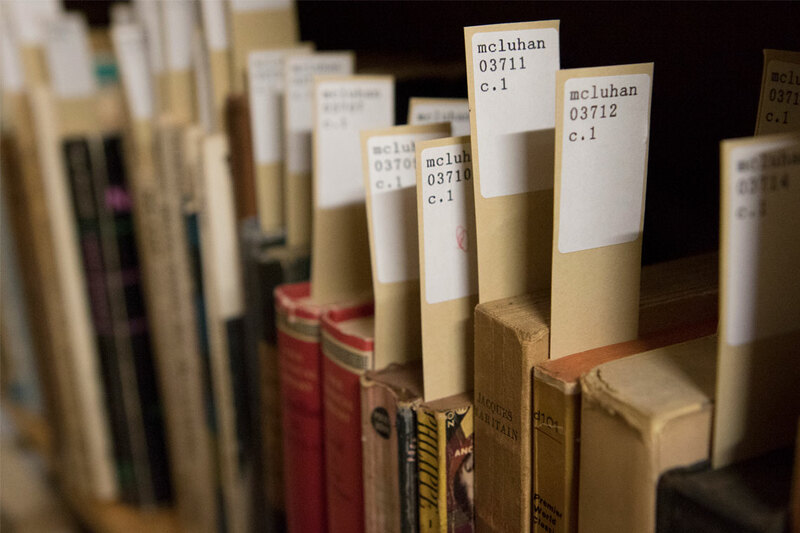 McLuhan’s book collection at U of T is as diverse as it is large, with subject matter ranging from media studies to English literature, Catholicism and philosophy. “You can really see the depth and breadth of his interests,” said John Shoesmith, outreach librarian at the Thomas Fisher Rare Book Library. Not only was McLuhan an avid reader, but he was an active reader – always making annotations in the margins of the books, on book jackets and the endpapers, said Shoesmith. This holds true regarding McLuhan’s obsession with Irish author James Joyce, particularly his notoriously difficult novel Finnegan’s Wake, of which there are five copies in his library, including a first edition. “One of the reasons for that is that he would heavily annotate one that he would need to get another one to continue his annotations,” Shoesmith said. His collection also includes the work of his colleagues at U of T like Harold Innis, as well as well-known theorists like Walter J. Ong and writer and artist William S. Burroughs. The UNESCO designation is affirmation that the McLuhan library is an important asset, not just for U of T students and faculty, but researchers all over the world who have been influenced by his writings, said Shoesmith.